A lightning-quick Travelling Salesman Problem delivery route optimiser. Multi-vehicle and looped/non-looped route support. 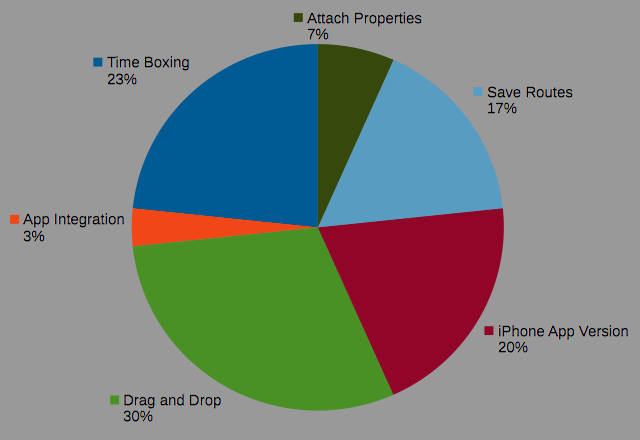 Location time-boxing constraints can also be specified via the API. Use of the Speedy Route API is subject to contract approval and is charged on a per-calculation basis. Please contact us directly for pricing, and for technical and licensing details. You may have noticed an extra drop down list that has appeared on the Speedy Route website in the last few days, with the title 'Maximum Number of Vehicles'. 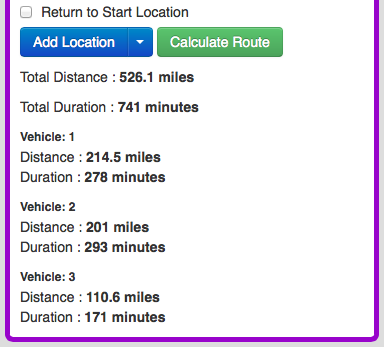 You can now instruct Speedy Route that it may use more than one vehicle when calculating the optimal route from your depot to your customer's locations if appropriate. The different vehicle route locations are shown on the map in different colours so they really stand out. Try it out either with 'Return to Start Location' checked or unchecked. If 'Return to Start Location' is left unchecked, the routes often resemble a 'star' pattern radiating from your depot, while 'Return to Start Location' checked produces different loop routes for your different vehicles.